I’ve been watching with morbid fascination the pace of construction and renovation going on in our Noe Valley neighborhood. Building crews claim street lanes and parking spots. Debris boxes and temporary no parking signs are featured on every block. I know that a lot of the activity in our Noe Valley neighborhood is caused by its friendly, diverse feel to potential buyers. We have kids, LGBT couples, and LGBT couples with kids. We have straight families, too! And, we all get to enjoy high walkability scores and four MUNI lines within blocks of our home. People want to live here. The real evidence of neighborhood desirability is the explosive upgrading of the housing stock. Garages are being dug under existing homes, solar panels are gleaming from roofs of refurbished top floors, comfortable ramshackle sleeping porches are being remodeled into glass-walled sun studios. We open our back door to sounds of sawing, banging, and progress in general. My attention is especially drawn to the work being done to the house just next to us. We have lived in our home for 20 years, and when we move in the place next door was owned by 80-year-old Mary who told us she bought it in 1945 for $8,000. Last year her son sold it to an LLC for $1.81 million. Since purchasing the place, the North Bay-owned LLC has started renovation, fired the designer, hired new architects, restarted, and directed 7-day-a-week construction that has gone nonstop since January. They’ve jackhammered to China in an attempt to convert the one-story house into a classy three-floor residence without raising the roofline. They have spent significant energy toward their goal of selling the updated building for $3.4 million. They’ve done everything except consult the neighbors and protect the San Francisco premium they paid for their property. Whoever moves into the gorgeous new home isn’t going to have the same neighborhood available to them that attracted the LLC in the first place. The LLC’s owner and his designers stopped talking to neighbors months ago and, of course, never asked us for advice. They are unconcerned that their out-of-the-city aesthetics will change the character of their investment. The construction dust has unapologetically infiltrated our houses for months, and the veneer of civilization has worn thin as the count of blocked driveways, blocked sidewalks, and billowing sawdust days has climbed. All of the annoyance is temporary, of course. But, the design of the property shows that the flippers come from suburbia. The house has elegant modern clapboards, a new style on this block. Inside, we’re told there will be more bedrooms, media rooms, and space utilized within an inch of its life. All good, but not necessarily San Francisco good. The telling un-San Franciscan detail is the high fences the LLC put up in the rear yard. We used to talk with Mary over the back fence. Now none of us can see over the railings. Good fences may make good neighbors, but high fences make suburban neighbors. Not only did we have chats with Mary over the fence, we got to know her through these accidental conversations. Similarly, on the other side of our yard, we now occasionally talk with our down-hill neighbors, see their children, and watch their dog play. A higher fence on their side would shield us from the occasional ball that their boys launch into our yard when they miss the basket hoop, but we’d also miss the off-hand comment that keeps us in touch in a real-world, non-Facebook way. 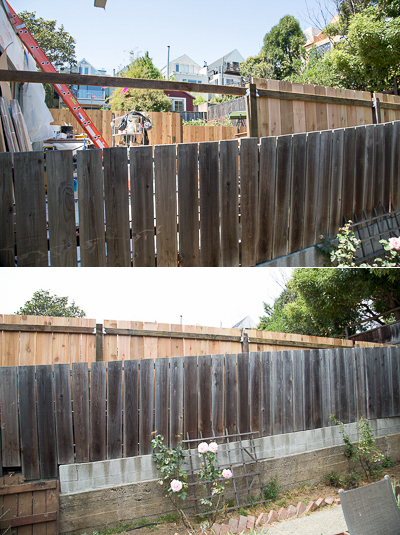 A lot of Noe Valley’s charm comes from over-the-back fence interactions. I hope our eventual new neighbors enjoy their spiffy home. I hope they enjoy Noe Valley as much as the people who live on either side of them. I also hope that they can overcome the suburban decisions that will make it harder for us to be San Franciscan neighbors.